Hello buddies. I am back again; this time with a scrumptious chicken curry recipe. 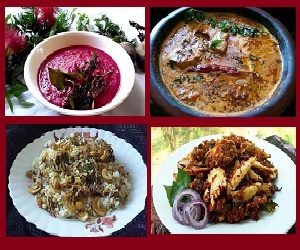 Kolhapuri dishes are known for setting your tongue on fire and then may be making your eyes water. But you just cannot help eating them because they are so luscious and irresistibly delectable. 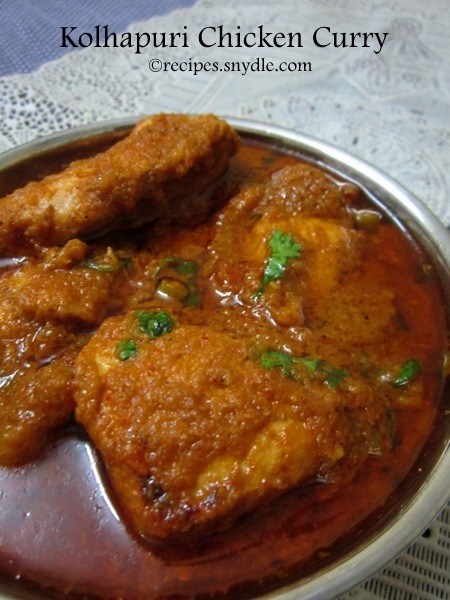 Kolhapuri chicken curry is one such delicacy that is hugely popular at the restaurants in Maharashtra. My family just loves spicy food and I decided to treat everyone with Chicken Kolhapuri for dinner last night. Bajra bhakri, a flatbread made from pearl millet, is the most perfect accompaniment with kolhapuri curries. However, we served the chicken curry with naan and roti and it paired up equally well with both. Plain and fragrant basmati rice served with feisty Kolhapuri chicken curry is the best thing that has ever happened to me! The sweet-smelling long grains of goodness, the richness of spices, the velvety gravy and the succulent bits of chicken; it’s like gastronomic Nirvana! I must tell you something beforehand. The amount of oil and spices added to this chicken curry is significantly greater than the other Indian chicken curry recipes. So do not be alarmed when you read the recipe. Having such lip-smacking dishes once in a while and then running on the treadmill next day to burn those extra calories is perfectly okay. I marinated the chicken for about 8 hours. I added some spices and ginger and garlic to the marinade. The creamy yogurt will lend it’s tanginess to the hot spices and create the perfect balance of the taste. Overnight marination will cause the chicken to absorb the flavors. I added a host of whole spices and some more garlic to the gravy base to get equally zesty gravy. To intensify the flavor, I avoided adding any water to achieve the desired consistency. I used home-made chicken stock instead. I had boiled some chicken in the afternoon for some other recipe and I used the stock to make this gravy. I had added a chopped onion, whole pieces of 1/2 inch ginger and 5-6 garlic cloves, some black peppercorns, cloves, salt, turmeric and water. I then pressure cooked the chicken for 2 whistles. I used the boiled chicken for making fried rice and reserved the stock for this one. An hour of hard work in the kitchen and bam!!! You have created one of the most iconic chicken curries all by yourself! For the purpose of measurement, 1 cup = 250 ml. 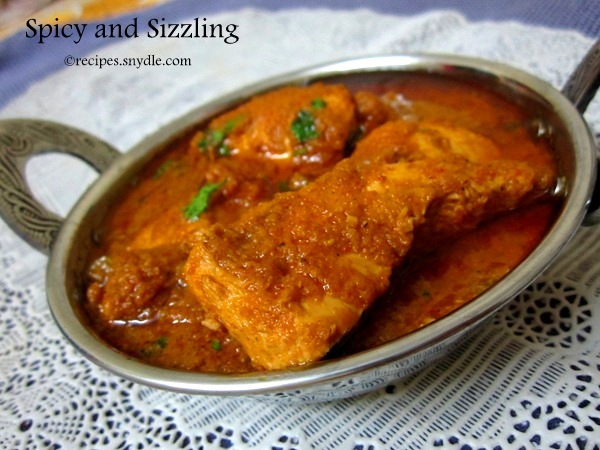 Now let us see how to make easy chicken curry, Kolhapur style! We need to start by marinating the chicken in yogurt and spices. In a big bowl, take the yogurt and whisk it till it’s smooth. Add in the red chili powder, salt, turmeric, garam masala, salt, crushed ginger and garlic. Give it a nice whisk. Marinade the chicken pieces well so that they get evenly coated in the spices. Cover the bowl and keep it in the refrigerator to marinade for 7 to 8 hours. When the chicken is ready, we shall prepare the gravy. Take a pan and heat 1 tsp oil (out of the 2 tbsp) and toss in the grated desiccated coconut and roast it on low flame till it turns golden and aromatic. This will take a couple of minutes. Remove the roasted coconut onto a plate and set it aside. Add the remaining oil and toss in the spices – whole coriander seeds, cumin seeds, black peppercorns, cinnamon sticks, bay leaves, star anise, cloves, green cardamoms, fennel seeds and garlic. Sauté them on low heat for a minute till the spices smell nice and change bit of a color. Add in the poppy seeds and sesame seeds and roast everything for another minute. Add in the onion, green chilies and sauté it on low to medium heat till the onion caramelizes and turns golden brown. Add in coriander leaves and cook for another minute. Turn the heat off and cool the mixture to room temperature. Grind the onion and spices with roasted coconut to a very smooth paste. If the paste is not smooth, you feel get a grainy texture from the spices, which is very unpleasant. You may use some water; I needed half cup of water to get a super-smooth paste. You can try straining the thick paste through a drum sieve, if you wish. It’s time to prepare the gravy. Heat 5 tbsp oil in a heavy bottom kadhai. Add in the marinated chicken and fry it for a few minutes till it turns golden brown. Add in the onion-spice paste and cook it till the oil begins to separate. Add in the turmeric and red chili powder and sauté for a minute. Add in the tomato puree little by little as you keep stirring the chicken. As the oil separates out, add in some more puree. Do so till you add in all the puree. Add salt and cook till the raw smell of tomatoes is gone and oil begins to separate again. The chicken will have been almost done by now. Now slowly incorporate the chicken stock and keep stirring the chicken. Cover the lid and let the gravy simmer away for 15-20 minute. The chicken will be cooked all the way and gravy will thicken. The lovely red, flavorful oil will float on the top. Turn the heat off and garnish with chopped coriander. 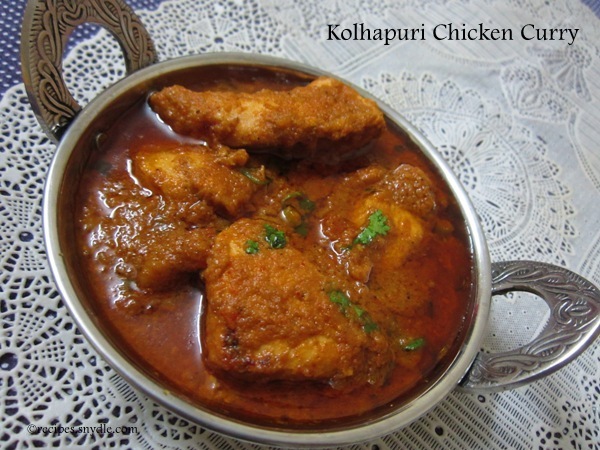 Now your Restaurant Style Kolhapuri Chicken Curry is ready. Serve hot with bajra bhakri, chapati or naan. 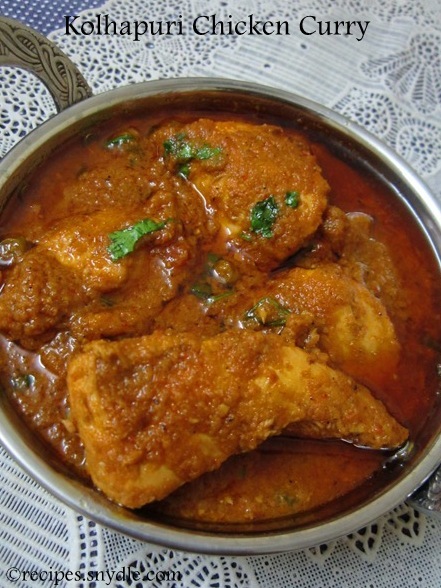 Enjoy hot Kolhapuri Chicken with a drizzle of fresh lemon juice.